This article originally appeared on the website Seeking Alpha on May 5, 2017. The railcar manufacturer has surged 52% since the election. Three years of industry pain have cleared the way for new growth. International acquisitions can push GBX forward. Insider sales and a JV partner raise questions. 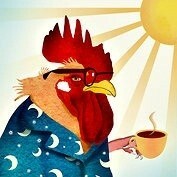 I feel like I’ve missed the train. Greenbrier (NYSE:GBX) was beaten up during the meltdown in commodities. The stock fell from nearly $80 at its 2014 peak to $22.30 in early 2016. The Portland, Oregon company surged over 50% after the election and has been north of $40 for several months leaving the enterprise with a market cap of $1.2 billion. Although I am reluctant to jump aboard anything moving faster than an airport escalator, GBX appears to have further upside potential. 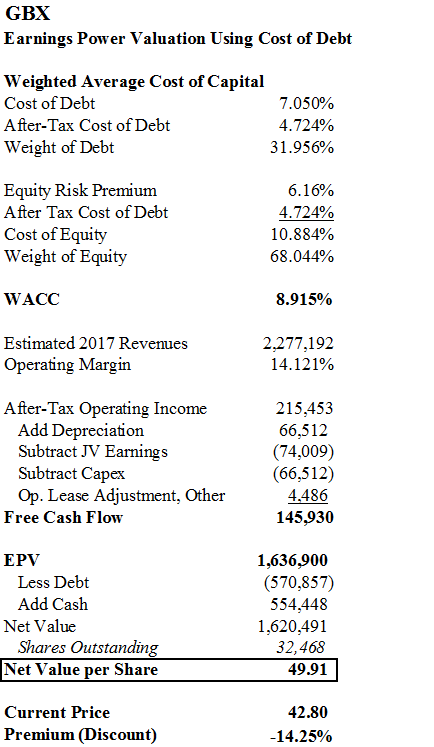 An earnings power valuation and discounted cashflow analysis indicate a share price headed towards $60. Greenbrier has made big acquisition moves in recent weeks. The ownership stake in Brazil’s Amsted-Maxion has been increased from 19.5% to 60%. 2017 will also mark the closing of the agreement with Astra Rail Management GmbH to form a new company known as Greenbrier-Astra Rail. By the end of the year, GBX will be the largest freight railcar manufacturer in South America and Europe, and number two in North America. Management has indicated that earnings per share will be between $3.25 and $3.75 at the end of FY 2017 (2Q FY 2017 results through February were released on April 5th). The Greenbrier-Astra benefit will be another $0.15 to $0.35 per share. Using these figures, GBX trades around 11 times FY 2017 earnings. GBX has also consistently posted returns on capital well above 15%. Greenbrier’s FY 2017 revenues will decline by 15.5% largely resulting from a drop in the order backlog from 41,300 railcars at the end of 2015 to 27,500 at the end of 2016. Early 2017 numbers show a backlog of 22,600 units. The order book has certainly dried up and will need to be replenished. 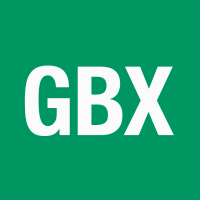 GBX posted FY 2016 sales of $2.68 billion. Operating profit landed just north of $408 million and earnings per share stood at $5.64. The deterioration in earnings per share to slightly less than $4 on revenues of $2.3 billion will be a marked departure from past trends. Insiders have recently sold shares. William Furman, the CEO, sold $5.8 million of stock at $44.50 in a filing posted on April 25th. 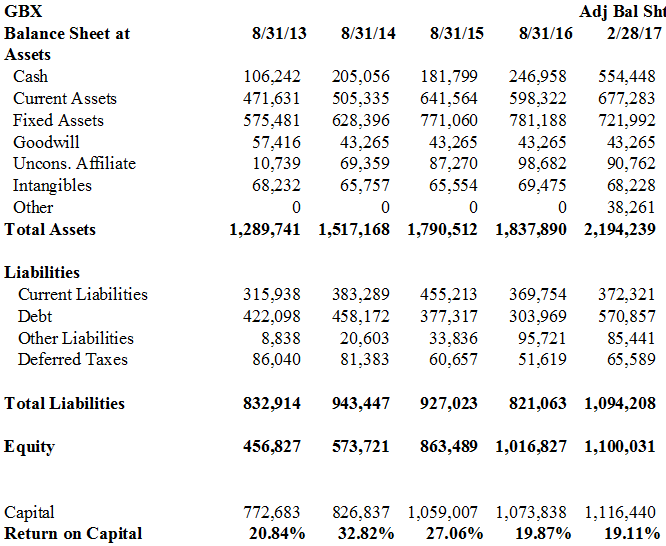 The CEO has over $71 million in value remaining in the company, but the sale is not insignificant. The company also faces possible dilution in 2024 when convertible bonds mature. The issue was completed in February and raised $275 million at a coupon rate of 2.875%. The notes are convertible at a price of $60.16 per share or a 37% premium. The conversion ratio of 16.234 shares per $1,000 of face value represents a 13% dilution to current shareholders. Convertible bonds are a wonderful way to receive low cost funds, but do they provide a telling glimpse into where management sees the upper limits of growth? Is $60 the top? I question the decision to issue convertibles in a low-rate environment. Why place any future dilution risk onto owners if you can borrow funds cheaply today? Shareholders deserve to reap the upside if more risk is added to the balance sheet. My biggest complaint with GBX is a lack of disclosure on the 50/50 joint venture with Mexican manufacturer Grupo Industrial Monclova, S.A. (GIMSA). GBX generated $408.5 million in operating profits in FY2016, and $282.7 million in net income. Unfortunately, a whopping $101.6 million was subtracted below the line because it is attributable to GIMSA. 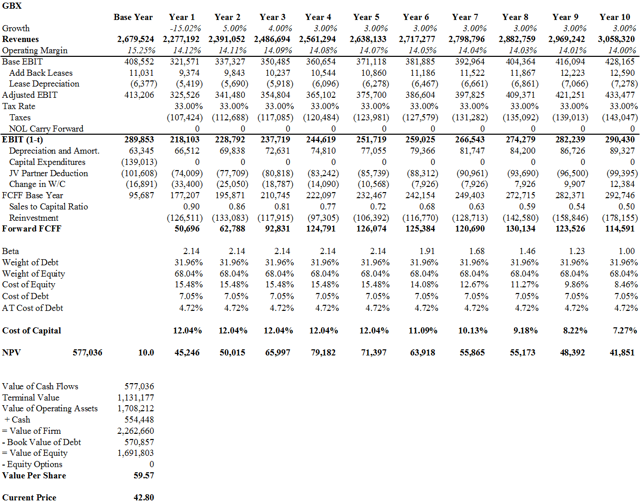 The distortion in performance metrics is significant: Instead of an impressive 15.25% operating margin, GBX shareholders only receive the equivalent of something closer to a 10% operating margin when the subtraction for income attributable to GIMSA is factored in. The GIMSA venture may very well be a profitable one for GBX, but the lack of clarity at the operating level is a huge gap for investors performing due diligence. It’s virtually impossible to discover the true contribution of GIMSA to top lines when little information is provided. Fortunately, as GBX grows the joint venture will be a diminishing factor. Lastly, I wouldn’t be doing my job if I did not at least mention potential liability for superfund cleanups in the Willamette River. The EPA study was concluded in late 2016 and final remediation costs are yet to be determined. However, GBX has certain exposure to the environmental damage. Estimates disclosed in the report vary widely, but could be as high as $1 billion. 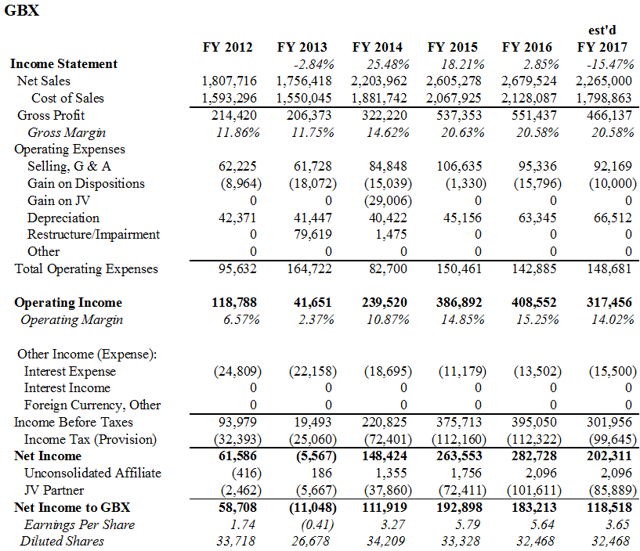 GBX derives 80% of revenues from railcar manufacturing and orders have begun to pick up after 3 years of declines. Gross margins have consistently been above 20%. 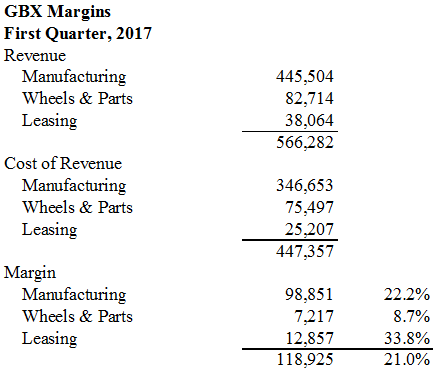 The leasing business has been a good contributor to growth and boasts 34% margins but it only accounts for 6% of revenues. The repair business looks lackluster as revenues have declined from $495 million in 2014 to $322 million in 2016. Recent deals with Mitsubishi UFJ Lease & Finance could help solidify the repair business going forward. Meanwhile, operating margins have held up well. They were north of 15% in 2016 and seem to be headed towards 14% in 2017. I performed two valuation exercises: An earnings power valuation and a discounted cash flow analysis. The EPV resulted in a value of about $50 per share while the DCF arrived just below $60. For both exercises, I utilized a revenue number of $2.277 billion for FY 2017 (slightly lower than the midpoint management guidance number). 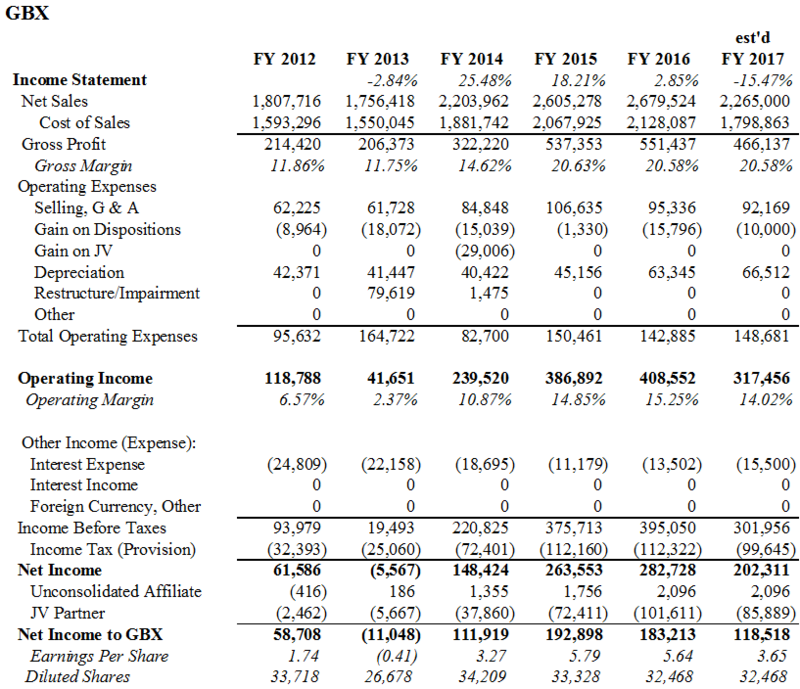 I assumed the GIMSA joint venture subtracts about 3.25% of revenue (lower than the 3.78% level of 2016). I employed an operating margin of 14.12%. The EPV analysis employed a weighted average cost of capital number of 8.915%. 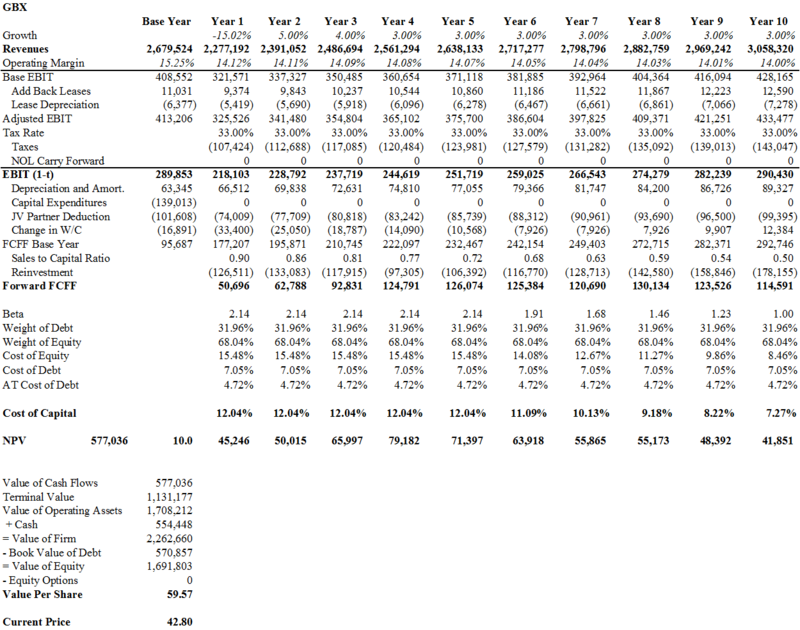 I calculated a yield-to-call interest rate on the convertible notes at a 37% premium to arrive at a debt cost of 7.05%. Some may question this number when the coupon is below 3%. As you will read below, the justification lies partially in attempt to reconcile the cost of capital with GBX’s high beta. Management presented growth capital expenditures at $60 million in 2017. 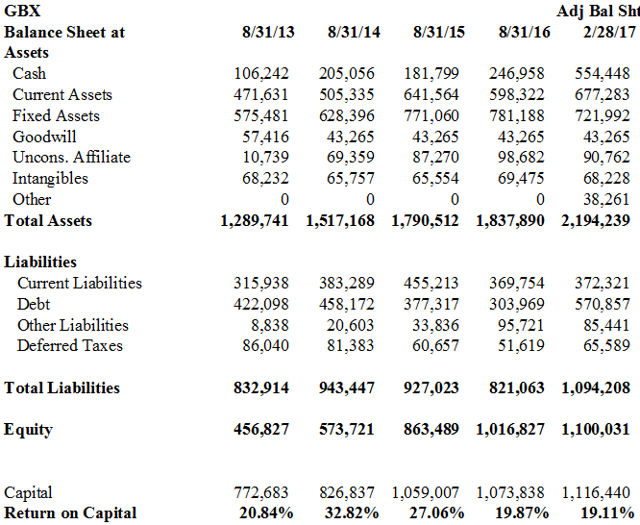 So I used capex equal to depreciation for a steady-state analysis assuming zero-growth cash flows. The DCF model utilized a weighted average cost of capital at a much higher level of 12.04%. The broad divergence owes to a high beta of 2.14. Capital expenditures are initiated in 2017 at $125 million reflecting both growth and maintenance requirements. Readers are likely to take issue with my analysis of convertible debt and the rate I have employed, so I welcome any feedback about perceived costs of capital. Disclosure: As always, the author has presented his own opinions and analysis. You should conduct your own due diligence before investing. I welcome feedback and discussion and I am happy to correct any errors or add any pertinent information to the article.